Link to image files has been fixed, sorry for the inconvenience. is still sometime confusing to me. Moreover pressure unit is really annoying to me, Americans use psi (use MKS unit system;-). Europeans likely use Bar (I'm OK ... 1 Bar is almost 1 atm,...easy!). My colleagees and I almost use Pa (it's international standard MKS!). Anyway, when I think of good display design for unit conversion program, I believe it's important that all the numbers in different units can be seen at one view all the time without scrolling. So I should control location and length of input number. I hope to have an input command just like Edit Box control used for Windows programming. I've been dreaming Casio Basic new command, LocInput which allows me to set coordinate and length of input, also I want to edit my input. So I made 'Input Box' for Casio Basic. It's called from main program and runs as sub-routine. 'IN' is file name of the Input Box. Z is returned by the Input Box and the return is substituted to any variable A.
but you have to allow scrolling. I do not like this. So, let me show you how the Input Box is making your program better. The Input Box appears where exactly I want with max 8 digits as I set. You can edit your input, add more digits or delete by DEL key. I have my answer; converted temp of liquid Nitrogen. Using Input Box, you see no scrolling and you see 3 values in one view. Now I hope you see what is about the Input Box and how it works on Casio Basic. 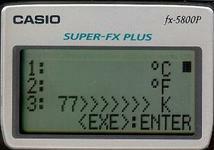 Just for your quick review, please try TempConv program for fx-9860GII. This version allows you to input decimal number. This version allows you to input positive decimal number and 0 (zero). This version allows you to input natural number (positive integer) and 0 (zero). 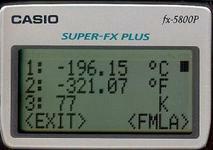 Indicator appears in the bottom line of LCD. Please especially take care of variables you use in your main program which call Input Box as sub-routine. Because Casio Basic is ultimate global variables system. Please do not use array variable Z[ ] in your main program. You can use other variables, but substituted value of those are changed during functioning of Input Box, so use those variables in your main program taking this into account. With slow fx-5800P, Input Box works properly (I should say acceptable in its response speed). Actually the first version was so slow, then changed its logic to get current speed. 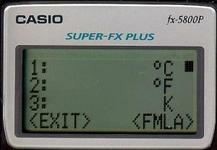 Input Box has been originally developed for fx-5800P which dose not have string functions in Casio Basic. So this Input Box handles only number input. 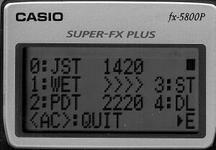 And this has been simply ported to fx-9860GII Casio Basic. I will probably introduce some programs using Input Box as examples. Edited by Krtyski, 15 July 2015 - 06:24 AM. The links to the sites http://egadget2.web....ives/in21g.html are broken/ blocked by antivirus softwares. Could you provide an alternate link. Thank you for telling me the link error. Let me make new link to download all the G1M files; Please try this.